Can Heavy Resistance Exercise Cause Constipation? Vitamin E is an antioxidant that encourages healthy red blood cells and may benefit the body's immune function. Antioxidant-rich diets may lower the risk of heart disease and some cancers, according to the Mayo Clinic. While constipation relief isn’t listed as a potential benefit of vitamin E by the Office of Dietary Supplements, vitamin E is found in many fiber-rich foods that are known to promote bowel movements. Constipation is typically defined as having fewer than 3 bowel movements per week, reports Medline Plus. Irregularity is usually associated with hard and/or painful stools or being unable to have a bowel movement after pushing or straining for longer than 10 minutes. Getting an adequate amount of fiber in your diet, defined as 20 g to 35 g daily, can help prevent constipation. The recommended daily allowance or RDA of vitamin E is 15 mg or 22.5 IU for men or women over age 14. Research is ongoing on the potential benefits of taking higher doses of vitamin E for cancer, heart disease and other health conditions, but, according to the Mayo Clinic, no verifiable medicinal uses of vitamin E supplementation beyond the RDA currently exist. Dietary sources of vitamin E include wheat germ, sunflower, almonds, peanuts, and green vegetables like broccoli and spinach. Broccoli, almonds, sunflower and whole wheat bread are also excellent sources of fiber. Drinking plenty of water along with dietary fiber will help pass the stool more quickly. Regular exercise can also help ease constipation. Taking high doses of vitamin E supplements can increase the risk of bleeding, cautions the Office of Dietary Supplements. 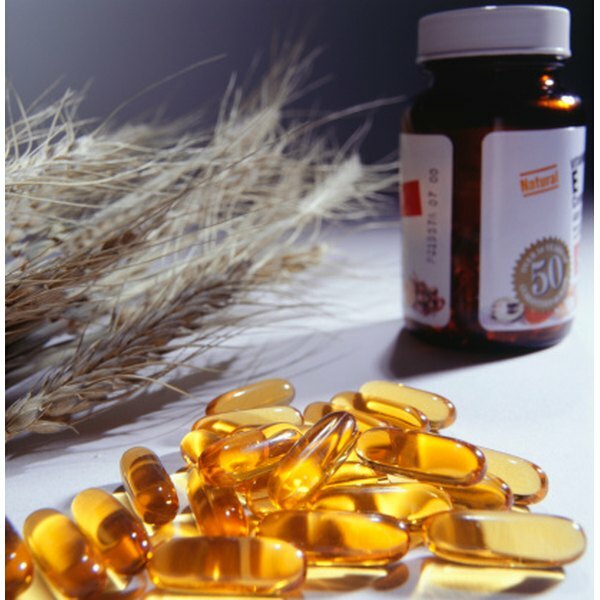 While rare, vitamin E deficiency can weaken the immune system and damage nerves and muscle that can cause loss of feeling in the arms and legs.The tolerable upper limit dosage of vitamin E supplementation is 1,000 mg or 1,500 IU daily for adults older than 18, according to the U.S. Institute of Medicine. Contact your health care provider right away if constipation persists or you have sudden constipation with abdominal pain and are unable to have a bowel movement.